Want to become a Maine Sea Kayak Guide! Join Maine Kayak on a six day instructional course to learn the skills to become a Registered Maine Sea Kayak Guide. Registered Maine Sea Kayak Guides have a long, rich history and are nationally-recognized as providing a very high standard in outdoor skills and know-how. 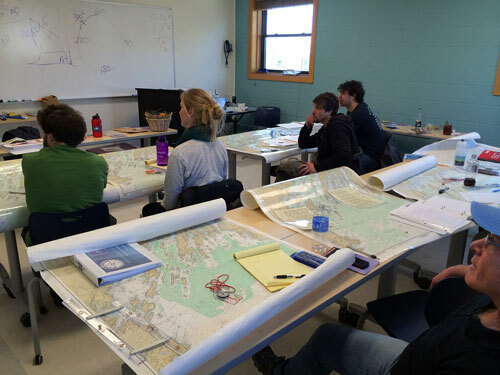 Our course will cover a variety of topics, including risk management, group dynamics, navigation, safety, outfitting, Maine coastal flora and fauna, leave no trace ethics and other subjects that will help you to prepare for the Registered Maine Guide exam. We will spend time in the classroom with powerpoint presentations, on water practical paddles and oral preparation exam. We provide course book and classroom materials, kayaks, paddling gear, paddling clothing and much more. The Maine Kayak guide course price includes the 40 hours training course, the State sea kayak guide test fee and 5 year Maine guide license fee. The State of Maine requires finger printing and a background check, which must be done on your own. Space is limited so call to enroll today! This 6-day course will have classroom and on-water practical sessions that will prepare you to take the Maine state sea kayak guide test, a requirement of all Maine sea kayaking guides. Course dates and location are listed below. The course includes all curriculum materials, kayaking equipment and paddling gear for the one on-water day, and instruction from a Master Registered Maine Sea Kayak Guide and other relevant professionals. Participants are asked to provide their own lunch for each day of the course, bathing suit/paddle wear, and a great attitude. If you agree to guide for Maine Kayak the course price includes the 40 hours training course, the DIFW sea kayak guide test fee and 5 year Maine guide license ($235 value). If you are just taking the course for skill building, the course price doesn’t include state test and license. You will need to schedule a background check on ($50) on your own.